Home › Artists › Jonathan Inc.
“Lost:time” is the latest release by sound auteurs JONATHAN INC. Several years in the making, it is a dream-like work of incredible density and further mines emotional depths suggested by previous efforts. The album is meant to be taken as a whole, rather than as a list of suggestions for a playlist. These tracks overlap, intertwine and bleed into each other. Thick slabs of feedback and keyboard squall surround and bathe these 12 melodic songscapes. Many songs resound with longing and questions unanswered. Soft voices rise and collide with clanging guitars, washed by waves of texture and deconstructed rhythm. The album is very much the logical next step in the evolution of the band’s trademark glistening guitars and soaring vocal harmonies, but this time it’s a more expansive vision and more extreme in its poles. From the opening strains of “Waiting for Morning” there’s a harder hitting sense of urgency than we’ve heard from the band before. This time out, their sonic pallet has expanded to include a near orchestral mix of acoustic and electric instruments – some processed beyond recognition. From synth drones to spider webs of banjo counterpoint, to walls of trombone blended with warm rays of lapsteel and warbling analog keyboards, there is a world of sound to explore here. In this space percussion dances around in the shadows, voices mesh in reverb and miniature guitarmies chime away in acoustic unison. Notes bend and stain against one another and songs drift out of the ether. The starry skies of tremolous Rhodes and sizzling cymbals rise then fade out into glorious sunsets of cascading sound. There’s something on the tip of their collective tongue, but it’s elusive and just out of reach, like the way a dream evaporates from your memory as you awake. It’s familiar somehow, but hard to grapple with. We call that ‘longing’, and try as they might, it seems to permeate the fabric of the music world they inhabit. While the band is now somewhat dispursed with the busyness of adulthood and separated by geography, they continue to perform sporadically, in living rooms and bars, in various iterations and incarnations. There are more songs still to be sung and more recordings to be made. Jonathan continues to produce and collaborate with artists in the studio, having worked on recent albums by Aidan Knight and In Medias Res among many others. 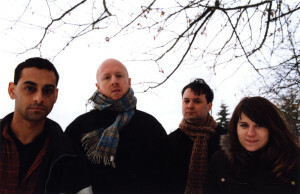 Jonathan Inc. began in  as a solo vehicle for Jonathan’s songs and has since distilled itself into a band. Twice nominated for Georgia Straight music awards, the busy multi-instrumentalist is also a founding member of theinternationally acclaimed Radiogram and has toured extensively with them across Canada and The United Kingdom. Anderson has also become one of the Lower Mainland’s most proli c producers working out of his studio, Buena Vista Audio. Besides Jonathan Inc., Anderson has recently produced albums for Maplewood Lane, Stabilo, In Medias Res, Jack Harlan and Hinterland.